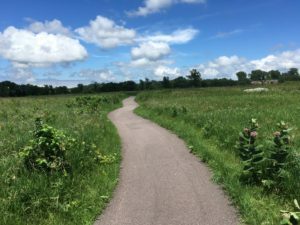 Imagine the prairie stretching endlessly in all directions, marked only by wild flowers, wheat fields, and rows of trees placed to break the wind and snow drifts. 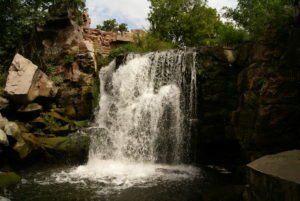 Now imagine a cliff side of sacred quartzite which breaks the monotony and leads to a beautiful, forested water fall. 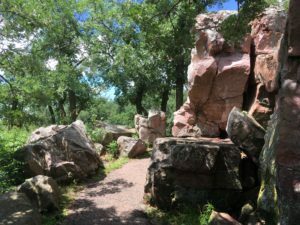 Such a place can be found at Pipestone National Monument in Pipestone, Minnesota! 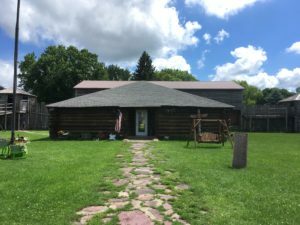 I visited the Pipestone monument recently, and found a simple visitors center located just blocks from downtown Pipestone proper. 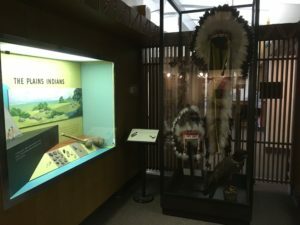 Inside clean restrooms and a small museum are open to the public, along with a demonstration room where craftsmen can be found fashioning the eponymous peace pipes from local stone. 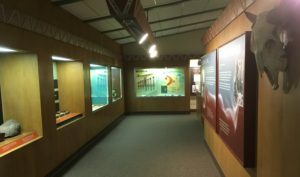 Pipes and other crafts are also available for purchase. 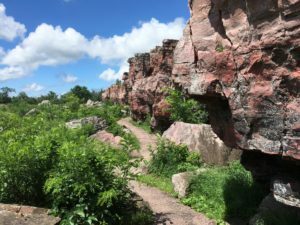 The real reason for my visit, however, was the Circle Trail, a 3/4 mile loop which stretches through the surrounding prairie, past a few pipestone quarries, and ultimately to those cliffs and the Winnewissa Falls! 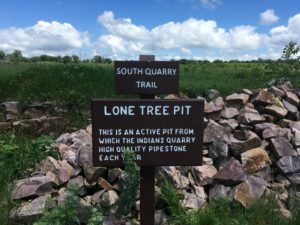 Travel tip: There is almost no shade out on the circle trail at Pipestone, and the only refreshments to be found are a single cash-only soda machine as you exit the visitors center. 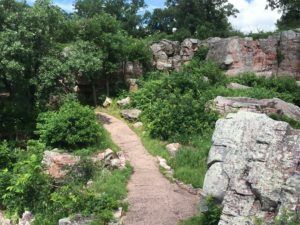 I’d recommend plenty of sunscreen and a full water bottle before hiking this lovely, but exposed trail! 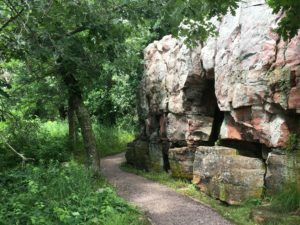 When beginning the trail, you’ll have a choice of turning right toward a few quarries, or of heading straight toward the cliffs. 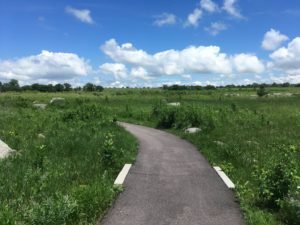 I began by going right, but ultimately returned to the main trail when I realized all of the smaller quarries had flooded during recent rain storms in the area. 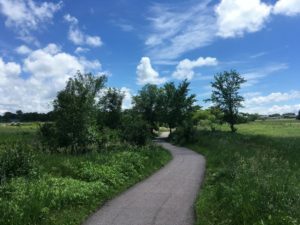 The Minnesota prairie is as calm and beautiful as any part I’ve visited yet! 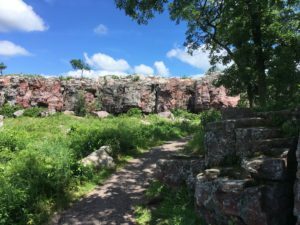 According to legend, it was on these cliffs that the Great Spirit appeared, instructing the various nations indigenous to the region that the red stone was their own flesh, and that from it their peace pipes were to be crafted. The area was made sacred, and no weapons were ever to be brought there, nor were any ever to be fashioned from the stone. 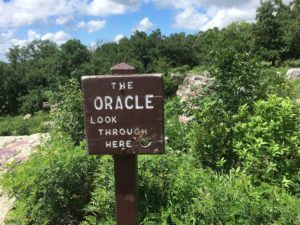 As I approached the wooded area, I finally saw a sign for the famed “Oracle” which they say lives beside the falls. 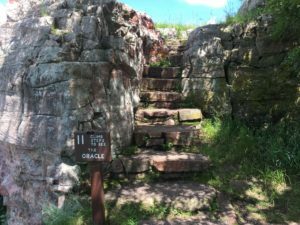 I climbed the hewn staircase and was taken by the beauty of the area. When I turned and found this sign, I admit that I was suddenly sure that the whole thing was a gag. Can you see the profile of the old man’s nose and chin? 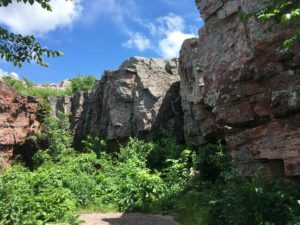 It took me a moment before I was able to make out the profile of the old Indian man’s nose and chin in the jutting cliff side. I don’t know what I was expecting, but the sight made me smile! 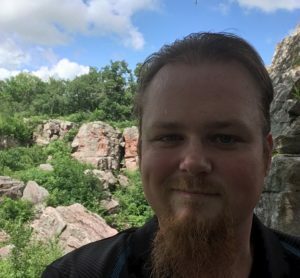 I returned to the path below and took a quick selfie with the wise old fellow before continuing on. 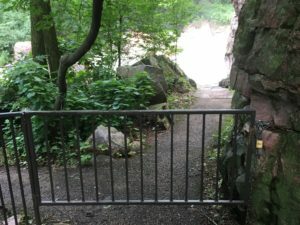 And that’s when my exciting plans for visiting the famed Winnewissa Falls came to an abrupt end. 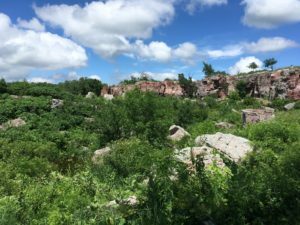 The recent rains had not only flooded some of the quarries, but they’d caused the falls to overflow and wash out the hiking path! 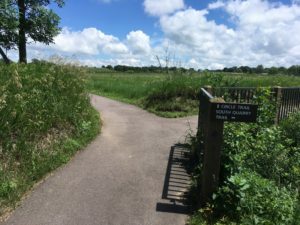 I was disappointed, to say the least, but not surprised, as the nice ranger back at the visitors center had told me to expect as much. 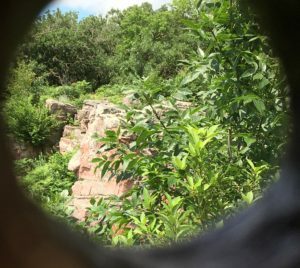 UPDATE: A regular reader from Florida has generously shared a couple pictures from her visit to the falls! A round of applause for our Winnewissa patroness! 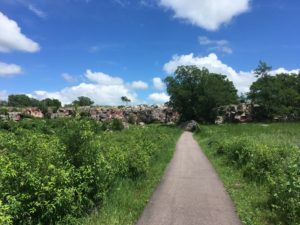 Now, the Pipestone National Monument is located on Reservation Avenue, and as you leave the visitors center, a few large boulders can be seen off to the right. 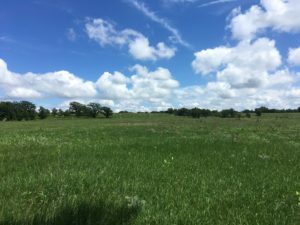 These comprise yet another sacred site, known as the “Three Maidens” (see last week’s Prairie Postcard). I recommend making a quick stop to take in the unusual sight. 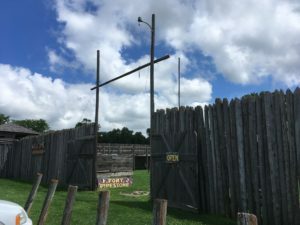 Continuing on Reservation, you’ll cross a road and immediately see the recreated Pipestone Fort. 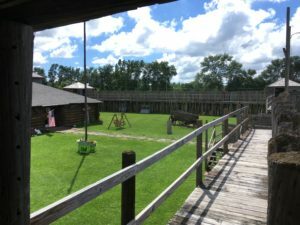 The fort has a few fun things to look at in its courtyard, but primarily is the location for the Pipestone gift shop, a building which is considerably larger on the inside that it looks on the out side, and which contains everything from Indian artwork to postcards, and even clothing and Christmas decorations! Sadly, there’s still nothing to cool a parched throat, so make sure you bring quarters for the soda machine back at the visitors center! 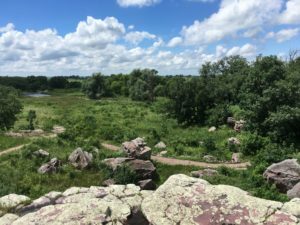 Whether you’re a solo traveler like myself, or are looking for a fun spot to take the kids this weekend, the Pipestone National Monument in Pipestone, Minnesota is a relaxing getaway featuring camping, hiking, and plenty of outdoor beauty right here on the prairie. And the best part? It’s totally free to enjoy! 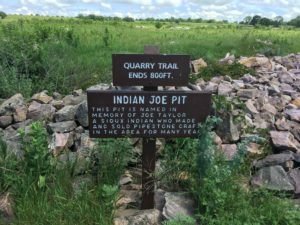 If you go, just follow the signs from US 75, MN State Highways 23 or 30, or from Interstate 29 in South Dakota. 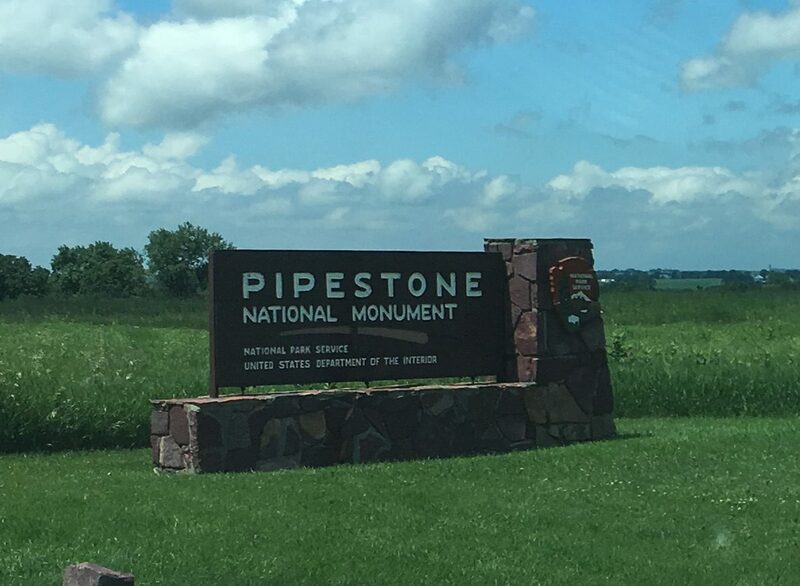 Pipestone is in the southwest corner of Minnesota. 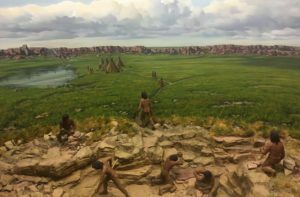 The monument is open 8-5pm (longer in the summer) daily, with the exception of Thanksgiving, Christmas, and New Year’s Day. 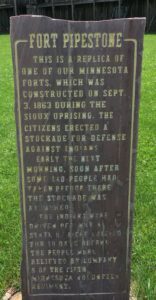 See www.nps.gov/pipe for more.Be sure to tell them that you read about the monument here on Prairie, Party of One! 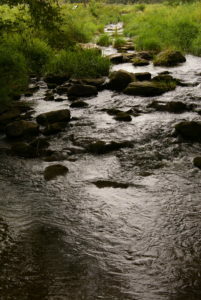 Have you been inspired by a beautiful waterfall close to where you live? 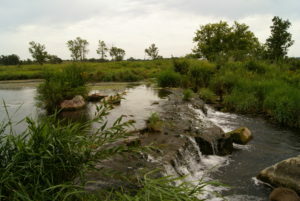 Are you as surprised as I was to find a waterfall in the middle of the prairie? Join the conversation by posting your comments below, and don’t forget to subscribe! 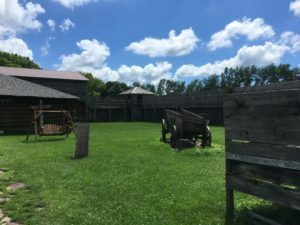 I loved this place! The residents in the nearby town were very friendly. When we were there we saw a man doing woodcarving. I agree; very nice people! Sadly, there were no pipe-carvers to watch on the day of my visit.